I woke up just before 4:00 am and almost immediately started crying, even sitting up gasping between sobs. The release of emotion had a calming effect as I laid back down and thought of my husband. Today I’d be spreading his ashes. I wiped away the tears from my cheeks, and sat up on the edge of the bed meant for two. I returned my attention to making coffee and gathered my writing materials for my daily journaling. As I sat in the semi-dark, writing my thoughts on the emotional start to my day, something caught my attention in the picture window to my left across the house. The moon was starting to set in earnest. My curiosity stirred. I turned off the reading lamp and waited for my eyes to adjust. I felt drawn to the moonlight like a Luna moth drawn to a porch light. The brightness of the moon was so intense, I shielded my eyes to better adjust to the winter landscape outside. A warm few days had melted most of the snow, revealing the dead stalks of native grasses. No animals materialized in the moonlit landscape, but I felt their presence, the rabbits like statues hoping to escape a predawn meal for a coyote or owl. My attention turned back to the rapid setting of the moon. The shadowy surface mesmerized me as the unseen energy filled my heart with joy. A smile spread across my face. 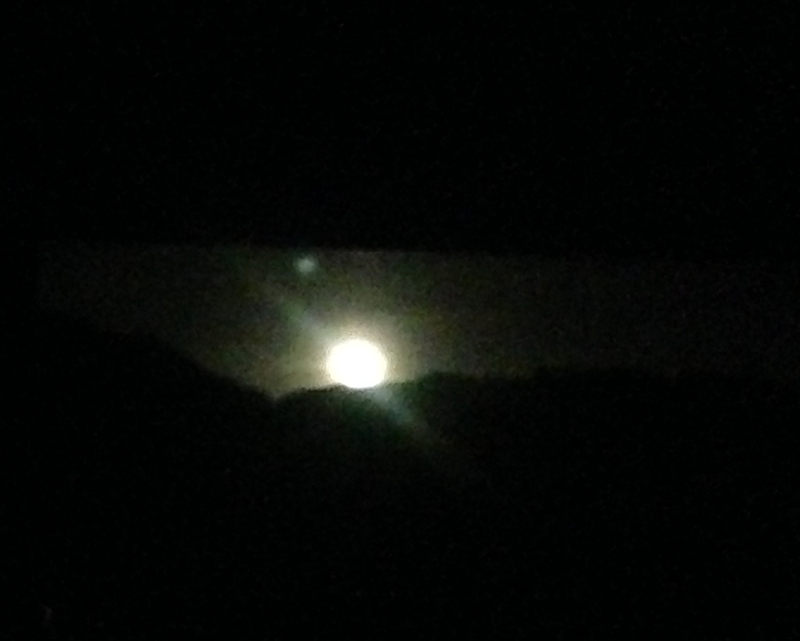 I continued to watch the moon gain momentum as it drifted downward toward the rocky ridge of Carnero Canyon. At the connection between the heavens and earth advanced I saw the outline of a pinon pine branch backlit by the moon. I imagined a giant magnifying glass between my eyes and the tree half a mile away. As I watched the final seconds of the moon’s descent, my chest felt warm in the beauty of the moment, grief banished. The bright orb slipped out of sight, leaving behind a glow in the dark sky. The simple act of being in the moment granted my soul peace and love. I was no longer a prisoner of my feelings. What had started as a very sad day had turned into the promise of happier times. What a beautiful description of overcoming grief. Everything was so well observed. Thank you, Rupert. I appreciate your kind comments. Very nice tribute to the comfort of the now. Thank you, Stacey. I’m so glad to see you on my blog. I think I might be getting it… learning how to really be happy. There is something magical about the moon. I’ve always been drawn to it just like you, Dawn. It’s peaceful and lights the dark just at the perfect time.